The Emerald West neighbourhood promises to add a new dimension in the fast growing and established Rawang with this weekend’s launch of Amberley 2 semi-detached parkhomes. 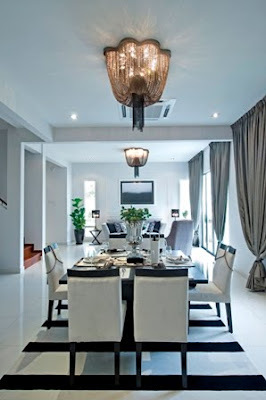 Amberley 2, developed by GuocoLand Malaysia, the property arm of the Hong Leong Group, offers an enticing proposition to home owners wishing to enhance their lifestyles and upgrade from their existing link houses. The new phase of 40’ x 80’ two-storey semi-D parkhomes comes barely a month after the overwhelming response of its first phase launch in October with a take-up rate of 80 per cent within two weeks of its unveiling. GuocoLand Malaysia will launch the new parkhomes at the Amberley 2 Fiesta at the Emerald Sales Gallery on Nov 27-28 (8am to 10pm). Exciting activities planned for the weekend include hot air balloon rides, fireworks display, and a live concert by local recording artistes. “Amberley 2 reaffirms GuocoLand Malaysia’s going forward efforts to introducing homes that exceed customers’ expectations and making the well-planned Emerald a township of choice,” said GuocoLand (Malaysia) Bhd Managing Director Yeow Wai Siaw. Amberley 2 offers high ceilings and generous window openings for better ventilation and abundant light. Yeow said many homeowners and investors had benefited from the maturity and popularity of the Emerald neighbourhood, adding its properties, including the April launched and sold out Ebony link homes had appreciated by over 20 per cent this year. The freehold 1,000-acre site, he added, is a fast growing self-contained township with an approved Chinese school currently under construction and a planned hypermarket. Priced from RM618,800, the thoughtfully-designed Amberley 2 offers three variants with four bedrooms (en-suite bathrooms for all first floor rooms), open courtyard, high ceilings and generous window openings for better ventilation and abundant light, separate laundry area and covered yard. The Fiesta will offer exclusive deals, including attractive home financing schemes and rebates for confirmed bookings during the weekend. Emerald West is part of the Emerald township, a joint-venture project between GuocoLand Malaysia and Hong Bee Land Sdn Bhd, with the former as project manager. Over 1,400 houses, including linked and cluster homes, semi-detached and premium bungalows have been completed and handed over since the township was launched in 2001. Apart from excellent infrastructure, the township enjoys good accessibility to Kuala Lumpur and surrounding areas via the North-South Highway, New Klang Valley Expressway and the Guthrie Corridor Expressway. Emerald is located within easy reach from Rawang town and its commercial hub, just 20 minutes drive from the Jalan Duta toll. As an established town, Rawang has all the essential amenities including banks, post-office, restaurants, hypermarkets, fresh produce market and a KTM Komuter station. Will there be more property mergers? Some two years ago, an analyst remembers telling a cash-rich property group to buy rivals with land to take advantage of a weak stock market. But worries over takeover issues led the group to buy land instead. In hindsight, it was a major opportunity lost. Now, major listed property players in Malaysia are in a bind because three recent deals to create much bigger companies are likely to push them to do the same if they want to remain attractive to investors. "They have no choice, some of them don't want to be off the radar screen of investors," said CIMB research head Terence Wong. The flurry of deals comes as the stock market hit record highs. On November 4, UEM Land Holdings Bhd offered RM1.4 billion to buy rival Sunrise Bhd, followed by news of a merger between Malaysian Resources Corp Bhd (MRCB) and IJM Land Bhd to create a group with a market value of RM7 billion. Then, Tan Sri Jeffrey Cheah proposed to combine his companies Sunway Holdings Bhd and Sunway City Bhd (SunCity) in a RM4.5 billion deal. The first two deals reflect the government's intent to create bigger companies to lure more foreign investors to Malaysia's stock market, analysts said. UEM Land is ultimately controlled by state investment arm Khazanah Nasional Bhd, while both MRCB and IJM Land have the Employees Provident Fund (EPF) as major shareholders. It is quite clear that the EPF is driving the merger, analysts said, as it seeks to develop the strategic and massive Rubber Research Institute land next to Kota Damansara, Selangor. Both deals are also about securing expertise as the buyer is in a hurry to grow. UEM Land needs Sunrise for high-end property development and marketing, while EPF wants a developer that could build townships (IJM Land) as well as commercial projects (MRCB). But the Sunway deal is more about the ability to fight for bigger jobs and address the liquidity issue. A major problem for Malaysian property companies is there are not enough shares readily available for trading, something that foreign investors love, said Maybank IB's analyst Wong Wei Sum. This means the stock price will have a tough time catching up to its fair value. In SunCity's case, it has been trading at around RM4, while analysts tag its fair value at almost RM7. "If you want to have better value, you go for the size," she said. But some property executives contend there are downsides to becoming a bigger group. "You could end up being a lumbering giant," one said. He cited how Mah Sing Group Bhd was able to buy some 25 hectares of land in Batu Ferringhi, Penang, for RM157 million. Bigger rivals had also bid for the land but Mah Sing was able to win as it moved faster than the competition. PETALING JAYA: The proposal to merge Sunway Holdings Bhd and Sunway City Bhd (SunCity) under a single entity via a takeover by Sunway Sdn Bhd (Newco) has received good response from analysts who view it as a positive synergistic move. Tycoon Tan Sri Jeffrey Cheah, who is behind Newco, also holds 47% and 44% in Sunway and SunCity respectively. Credit Suisse said investors generally felt the proposed merger was to eliminate inefficiency from duplication of property businesses. Both companies have their respective property divisions, which means two different property teams running independently, and in some cases, competing against each other for the same property pie, despite having a common shareholder and the same Sunway branding, it said in a report yesterday. Also, the research house said, the new larger entity would make it more investable. As two separate entities, the market capitalisation of RM1.4bil for Sunway and RM2.1bil for SunCity made them not so investable and relatively illiquid despite having over 50% free float. This resulted in both stocks trading at a significant discount to their peers. We believe this was one of the key drivers for the merger, said Credit Suisse. The management of the companies was quoted as saying the rationale behind the merger was to have a new entity with a bigger scale and able to extract synergies through economies of scale and integration. 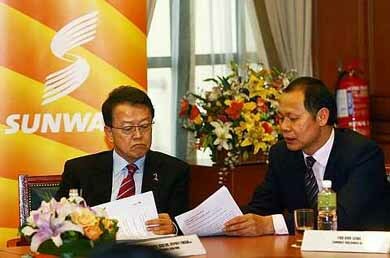 On Wednesday, Sunway and SunCity received a takeover offer from Newco for RM4.5bil in cash-and-share swap. Newco will issue an equivalent value of shares representing 80% of the offer prices and pay cash for the remainder 20%. The offer would also include Newco issuing new warrants for free to all shareholders of SunCity and Sunway on the basis of one Newco warrant for every five Newco shares. Based on SunCity and Sunway's last traded prices of RM4.49 and RM2.25 respectively before the announcement, the offer prices represented a premium of 13.6% and 15.5% respectively. The merged entity could be valued at RM4.5bil, making it the fourth largest property company in Malaysia. But, Credit Suisse said, at this stage it was not known who would be leading the merged entity and whether key management personnel of the respective divisions would be retained. At this stage, we are not aware of Government Investment Corp's (GIC) stand on the proposed merger, given that the merger will dilute its current 100% exposure to property to 65% in Newco, it said. GIC of Singapore holds a 21% stake in SunCity. We also do not know if Newco will retain its other businesses or dispose of its non-property businesses, like the trading, quarry, construction, and building materials divisions, said the research house. Meanwhile, Hwang-DBS Vickers Research in a report said the offer price of RM2.60 per share was fair for Sunway. The offer price is at 4% discount to our sum-of-part derived from target price of RM2.70. This values Sunway at 13 times of its financial year 2011 earnings per share and 1.6 times book value versus the sector average of 18 times and 1.6 times respectively, it said. It added that Sunway would be able to leverage on the presence of GIC, SunCity's strategic shareholder and the larger market cap would help build a stronger institutional following. Cheah is expected to have more than 40% in Newco and GIC 12%. GEORGE TOWN: The RM2.7bil Penang Sentral project in Butterworth is expected to generate economic spill-over effects of about RM8bil when the entire project is completed 10 years from now. Malaysian Resources Corp Bhd (MRCB) executive director Datuk Ahmad Zaki Zahid said at a press conference that work on the first phase, comprising an integrated transportation hub with a retail component, would start next month. The first phase, estimated to have a gross development value of at least RM400mil, is scheduled for completion by Dec 2013. Work on the second phase is expected to start even before the completion of the first phase, he said. Work on the third and final phase is expected to start five years from now. The second and third phases are commercial components, comprising a commercial hub, including office towers, serviced apartments, a hotel and waterfront amenities, scheduled for completion 10 years from now. Zaki spoke after the Land Public Transport Commission chairman Tan Sri Syed Hamid Albar launched the Rapid Penang I Planner logo. In May this year, MRCB Utama Sdn Bhd project manager (project/property) Zamri Mat Zain had said that the first phase would miss the July 2011 completion deadline due to delays in land acquisition. Zaki said construction of the first phase was likely to generate some 2,500 jobs. By the time the entire project is completed, some 15,000 jobs would be created, generating an economic spillover effect of about RM8bil, he said. Ahmad Zaki added that the gross development value of RM2.7bil was a conservative figure, which was likely to increase next year. The Penang Sentral project, developed by MRCB in partnership with Pelaburan Hartanah Bumiputera Bhd, is part of the Northern Corridor Economic Region initiative. 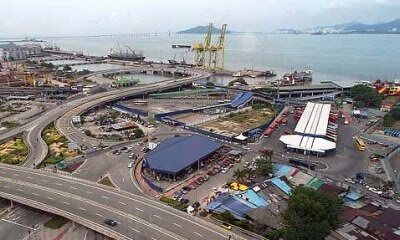 The two companies formed a joint-venture firm, called Penang Sentral Sdn Bhd, which would undertake the development of the transport and commercial hub. MRCB Selborn Corp Sdn Bhd, a subsidiary of MRCB, has been appointed to manage the development, design, construction, completion and maintenance of Penang Sentral. The transport hub is expected to cater to approximately 65 million passengers a year. Meanwhile, LPTC chief executive officer Mohd Nur Ismal Kamal said that the commission would next month start to finalise the public transport policy for the country. It will take nine months to finalise the policy, as the LPTC needs to assess the data collected from all over the country on the needs for public transportation in different towns and cities, he said. We will then know what kind of public transport programme is needed for which towns and cities in the country, he said. KUALA LUMPUR: IREKA CORPORATION BHD has secured a RM232.74 million contract for the proposed offices and hotel development in Kuala Lumpur. It said on Friday, Nov 26 its unit Ireka Engineering & Construction Sdn Bhd had received a letter of intent from Transmission Technology Sdn Bhd for the project. Ireka said the project involved architectural and mechanical and electrical works for basements and the 13-level podium and also the 27-storey and 37-storey office towers. Earlier, it announced net loss of RM87,000 in the second quarter ended Sept 30, 2010 compared with net profit of RM2.13 million a year ago after accounting for the share of loss in Aseana Properties Limited. Revenue rose 21% to RM108.02 million from RM89 million and it recorded loss per share of 0.08 sen compared with earnings per share of 1.87 sen.
For the first half, revenue rose 11.5% to RM209.736 million from RM174.610 million mainly due to higher volume of construction works being completed during the period. At the pre-tax level, it recorded a pre-tax loss of RM2.868 million, as compared to a pre-tax profit of RM5.789 million in the previous corresponding period. “The loss is after accounting for the share of loss in Aseana Properties of RM7.503 million and also a mark-to-market loss for share investment in Kinh Bac City Development Shareholding Corporation of RM1.986 million. Excluding these two items, the Group’s pre-tax results would be positive at RM6.613 million,” it said. Glenmarie Properties Sdn Bhd expects a total gross development value (GDV) of RM380 million for its newly launched project, Glenmarie Gardens, in Shah Alam, said chief executive officer Mohd Radzman Othman. the project launch in Shah Alam today. He said the houses will be built in two phases, with Phase 1 comprising 14 units. Construction work for Phase 1 will start in May next year. The houses come in seven distinctive architectural designs, featuring their own characteristics to suit the different needs of the potential owners, he said. Mohd Radzman said the build-up area starts from 5,910 square feet and tops at 8,033 square feet while the land area starts from 8,364 square feet and stretches up to 14,693 square feet. Glenmarie Properties formerly known as HICOM Properties Sdn Bhd is a trusted name in property development and the hospitality industry. Its iconic projects include Glenmarie Court, Glenhill Saujana, Glenmarie Residences and Glenpark, all within the vicinity of Glenmarie and Shah Alam, and on the commercial development portfolio completed projects include the Accentra Glenmarie and Glenmarie Industrial Park. Clockwise from top left: Life category clinched by Foong Zaai Yuen, Nature category by Muhammad Syafiq bin Adnan and Architecture category by Ngeow Yen Churn. 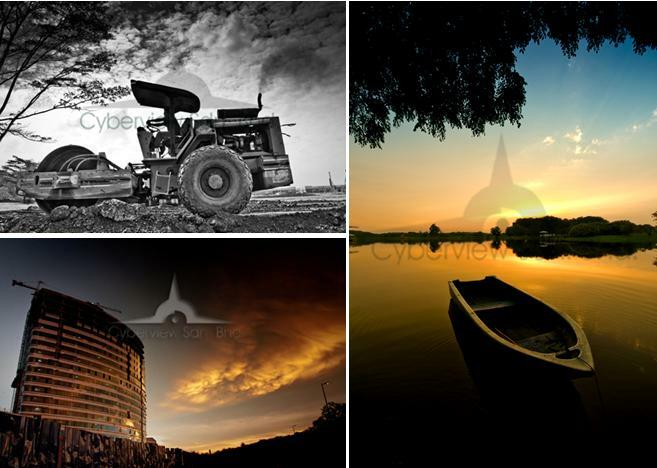 Cyberview Sdn Bhd, landowner and development spearhead of Cyberjaya recently announced the winners of Cyberjaya – Images of Glory digital photography contest. The contest, which was held from July to August this year, featured the three categories of Live, Architecture and Nature and attracted more than 1,000 entries. The entries, which were published online at www.cyberview.com.my/dpc-vote, were narrowed-down to the winners based on a combination of popular online public votes and scoring by a panel of professional judges. “We were thoroughly impressed with the calibre of the photography skills and personal interpretations of Cyberjaya life expressed through the contest entries. It was our goal to give Cyberjaya a platform to present the cyber city’s four pillars of Live, Study, Work, Play and the results are a tremendous success,” said En. Ir. Hafidz, Managing Director of Cyberview Sdn Bhd. “Each one of these images reflects a different facet of life in the city, be it through the way our community lives, the architecture, or the natural beauty within it. We’re delighted so many people wanted to share their experiences through this competition, and we even had participants from all over Malaysia,” he added. The first prize winner received RM1,500 in cash, while the second and third place received RM1,000 and RM750 in cash respectively. All winners and consolation prize recipients also received a certificate of participation. The prizes were presented by En. Ir. Hafidz and Rashid Mat, General Manager for Business, Corporate Communications and Planning for Cyberview. As an added recognition of their achievements, all photos from first to third places in each category will be permanently displayed at the foyer of the Kelab Komuniti Taman Tasik Cyberjaya. Foong Zaai Yuen clinched first prize in the Live category with an interpretation of the burgeoning development scene at Cyberjaya – a black-and-white portrait of a tractor in the midst of earthworks. Foong is a software engineer who is intimately familiar with life in Cyberjaya, having started her campus life in Multimedia University and working in Cyberjaya since. According to the judges, Foong aptly captured the daily life she witnesses and enjoys in the cybercity in this simple yet powerful picture. “I do not own a camera, and yet I always borrow cameras from my friends who are avid photography fans. And yes, I am a contest lover”, said Foong. The Architecture category was dominated by entries showcasing new and existing buildings in Cyberview against serene Cyberjaya landscapes. Ngeow Yen Churn took home first prize for a picture of development in Cyberjaya bathed in the evening sunset. Ngeow is an engineer and researcher who has been living in Cyberjaya for the past six years and he has seen this city grow to fulfil its full potential. “Capturing Cyberjaya on camera is always interesting as the landscape is so beautiful. I especially love wide-angle views of Cyberjaya with fluffy clouds on the sky, and my entry was no exception. The sunsets here are awesome! Every day is a new experience at Cyberjaya”, said Ngeow. For more of Ngeow’s work, visit www.photogmao.com. Life in Cyberjaya is not always full of the hustle and bustle of new developments and people who live, study, work and play in the cybercity. Muhammad Syafiq bin Adnan captured the serene side of the Cyberjaya with his still-life portrait of a lone rowboat at dusk at Cyberjaya’s lake gardens, which garnered the top place in the Nature category. Syafiq works as a MainBoard designer in Sony EMCS but photography is a major passion in his life. No stranger to success, his win represents his second accolade as champion in a photography contest for the Nature category. “I love everything about photography, and it doesn’t matter whether I do it for contests or for leisure. I just love capturing something that I can share,” said Syafiq. To view Syafiq’s photos, please visit www.capixadnan.com. As the youngest contestant at only 15, Crystal Ng Pei Qi clinched third prize in the Nature category, while also taking home consolation prizes for both the Live and Nature categories. “After being elected as a member of the Cyber Brigade in my school, I gradually developed an interest in digital photography and I bought my first DSLR in 2009,” she said. Ahmad Rafidi Rofie, another notable contestant, came all the way from Penang to Cyberjaya over a couple of weekends just to capture dawn photos of the cybercity for the contest. His hard work was rewarded when he won a consolation prize in the Architecture category. “We were pleasantly surprised with the quantity and quality of the entries. The judges had a tough time determining the winners,” said En. Ir. Hafidz. “Over the years Cyberview has actively carried out its role in masterminding the development of Malaysia’s pioneer and premier cyber city. The amount of interest which poured in for this competition alone is a clear testimony of our success in developing Cyberjaya into a vibrant place to live, study, work, and play,” he added. CYBERJAYA: Cyberview Sdn Bhd wants to lift the Green City status of Cyberjaya by pulling together key stakeholders to share ideas and knowledge through a series of talks. The iGREET series (Information on Green Technology), which started in May, is held once a month and is among the initiatives that Cyberview has taken to raise green awareness among the Cyberjaya community. Managing director Hafidz Hashim said the company conceived the iGREET series an initiative to champion ecological responsibilities for Malaysia's leading cybercity and MSC Malaysia hub. Cyberview is in a unique position to bring together key stakeholders including Cyberjaya's local authorities, building developers, tenants and community members in one place to hear how green technology can translate into long-term benefits, he said in a statement which was given out at the sixth iGREET seminar yesterday. At the seminar yesterday, media and guests were given a presentation of Proton Holdings Bhd's innovative hybrid car that was slated to be launched next year. YTL Corp Bhd's first-quarter net profit for the period ended September 30 2010 jumped by 34.4 per cent to RM278.9 million over RM207.5 million recorded last year. Revenue for the first three months of the year ending June 30 2011 improved by 12.1 per cent to RM4.4 billion compared with RM3.93 billion previously. The group told Bursa Malaysia yesterday that the increases in revenue and profit were substantially due to better performance in its multi-utilities business segment and higher recognition from its offshore property development projects. In a statement, YTL group managing director Tan Sri Francis Yeoh said it had made a strong start to the current financial year. "We expect the rest of the year to be promising," he said. Yeoh said the launch of the Yes 4G mobile Internet service with voice last week and creation of its ecosystem were geared towards spawning further innovation and investment. On other fronts, he said the group had earlier this week announced the restructuring of its property development businesses. The restructuring was part of a wider ongoing rationalisation exercise to reorganise YTL's property, retail and hotel assets, and house them within the relevant business divisions. This started last year with the repositioning of Starhill REIT in Malaysia as a global hospitality REIT, involving the disposal of the trust's retail assets to Starhill Global REIT in Singapore, which was completed in June 2010. "Starhill REIT will now focus fully on hotel and other hospitality-related assets, both in Malaysia and abroad, whie the concentration of our property development assets under one umbrella is targeted at transforming the division into an international property developer," he said.